Out of the blue in 2007 I received a couple of CDs to review by a Chilean band with the bizarre name of La Desooorden – I still don’t know why there is an extra ‘o’ in there – and I was immediately smitten with their sound incorporating rock and ethnic rhythms through the use of a multitude of percussion and other instruments. In 2012 I reviewed what turned out to be their final album, El Andarín, which was even better, but by the time the album was released the band had folded. A great shame as they had done a lot to progress their unique sound. Now we have Homínido, a rock-fusion group from the city of Valdivia, comprising founder and permanent members of La Desooorden Rodrigo González Mera (drums and percussion) and Francisco Martín (bass) with guitarist/keyboardist Pablo Cárcamo who also plays with prog metal band Noniacorde. Cárcamo’s style adds real bite to the dextrous rhythm section who are very comfortable in their new home, the basis of the group being a classic instrumental power trio. 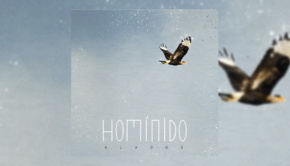 However that doesn’t tell the whole story as the core of Homínido are expanded by vocalist Eliana Valenzuela with occasional input from violinist Benjamín Ruz (who also handled the string arrangements) and trumpet/flugelhorn player Cristopher Hernández. 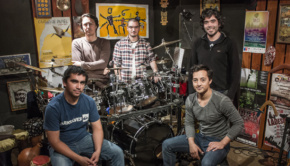 Homínido made their debut at a jazz-fusion festival in Mexico in 2013 and have been adding new tracks to their Soundcloud page since. Now they have unveiled their debut album, entitled Estirpe Lítica which translates to “Kindred Lithic” (‘Lithic’ as in ‘Monolithic’). A concept piece, it considers the ancestral relationship between humans and ancient stones and the transformations that lead to them being used in the construction of homes, temples, tools, river defences, roads, pavements, aqueducts, etc. It’s a journey through time but also a reflection of the importance that stones have had in human evolution, all of the tracks composed by Cárcamo and González Mera. My very limited Spanish is unfortunately not up to the task of interpreting the lyrics but it appears that the journey takes us from Babylon through the ancient civilisations of what is now Mexico and on to the present day. The music on Estirpe Lítica is a fusion of high-energy rock with jazz influences, sometimes heading into metal territory courtesy of the guitar work which elsewhere brings Santana to mind. Indigenous South American sounds and rhythms are added to glittering effect, the drums and percussion of González Mera driving the compositions along with the often gritty guitar of Cárcamo buzzing around like a disgruntled wasp; there is an energy and vitality in these pieces that stretches out as the music demands but retains a purposeful focus. The pieces are concise in that they do not outstay their welcome and retain the interest but there is still space for them to breath. The instrumentation flows beautifully through each phase and the vocals together with the contributions from string and brass are pitched just right for maximum effect. It is this attention to detail that gives Estirpe Litica the legs for a long shelf-life as you hear new elements every time you listen. There is an awful lot going on within the songs. The rhythms feature Latin dance and Indian sounds and are guaranteed to get inside your soul – I dare anyone to listen to this album and not be swept away by the rhythmic movements at some point. It’s toe-tapping stuff which contains a primal force that would surely go down a storm in a live setting in much the same way as Lazuli, a band that sounds very different but has a similar knack for plugging their complex music directly into the most primitive parts of the human psyche where rhythmic movement is everything. The recording, self-produced by the band, is top quality, all of the parts leaping out of the mix to grab the listener by the throat one minute, soothing them with a restful tranquility the next. There are clearly skilled hands at work here and the CD sounds superb to these ears. The strings and brass add impressively to the whole, used sparingly to take the music in new directions and adding a variety that keeps the album on track as a fascinating listening experience throughout. Opening track Simún (‘Sirocco’) tells of the sandstorms of the African and Chilean deserts that destroy everything around them, but it also alludes to the many storms that we may face in life, such as divorce or the death of a loved one. The intro smacks of jazz-fusion, the slap bass from Martín particularly noteworthy, and immediately there is a drive to the music that contrasts well with the authoritative vocals of Eliana. There is plenty of meat in the band’s sound throughout the album; the aforementioned grittiness to the guitar and metallic elements wrapped around complex rhythmic patterns with Eliana’s vocals and the other instruments adding softer and more organic elements. It all comes together beautifully. The core trio of musicians work together like a dream and set up a fantastic flailing instrumental palette, invigorating and energetic such as on Ciudades de Piedra (‘Stone Cities’) and the opening of Insano Devenir (‘Insane Future’) which emerges in muscular stop/start Math Rock fashion, both tracks using eloquent tabla to add colour. Eliana’s vocals are to be commended as she offers a commanding presence within the instrumental dexterity that gives the album focus and continuity. Her delivery is rich with pure South American emotion but her voice also has a more fragile edge that she displays with real style when required. The arrangements are superb, showing off the capabilities of the core trio but imbuing the pieces with the necessary depth and definition, as with the atmospheric Desde Las Cumbres Al Mar (‘From the Peaks to the Sea’) or the violin led Eastern introduction to Shalagram Shilá where tabla takes up the rhythm to support well aimed input from Cárcamo’s guitar. The title comes from the Hindu words for a sacred stone of India and suggests that everyone has an ‘amulet’ to protect or help them through life. The playing reaches epic proportions towards the end of this one whilst retaining the Indian influences – quite a feat and it all sounds great with the volume cranked up! As a counterweight, the instrumental Eterno Retorno (‘Eternal Return’) is packed full of South American rhythms, Cárcamo’s guitar deploying sheets of sound and stalking around with real edge. The captivating drums and sparkling cymbal work add drive, combining with trumpet as the piece becomes an instrumental tornado to head towards a furiously intense climax. As the title suggests, Cabeza de Piedra (‘Head Stone’) sees Homínido coming out of the blocks like a metal band, the pace changing as Eliana comes it. There is a sinister edge, the intensity of the guitar coupled with the persistent rhythms giving the song a compelling finesse and it is clear that these guys really know what they’re doing. Elsewhere Mi Roca Interna (‘My Inner Rock’) is more laid back with a sublime vocal performance, the rhythms again purely South American, enhanced by the percussion with violin and piano adding a wistful edge. Just beautiful. The textures conjured up by Rodrigo González Mera from his array of percussion cannot be underestimated and his contributions add greatly to the detail inherent throughout the album. The basis of the music may be founded on a metal infused rock power trio but the melodies, cadences and organic nature give it a characteristically Latin feel until tabla spins our thoughts off to the sub-continent. The juxtaposition of the inherent muscle in the central musicians versus the various acoustic textures are what make make this recording extra special. It is exciting, intrinsically fascinating and wonderfully conceived, the finished product being something of which all concerned can be justly proud and deserves a wider hearing. Nothing sounds bolted on and it is the natural synthesis of the individual parts that makes the album work as a whole. Intensity and enthusiasm remains at the heart of the music. There is true energy and all of the performances are noteworthy yet not allowed to overshadow or take away from the importance of the songs as a whole. The almost angry parts are offset by the fragility of other elements to produce real depth; kick drums can hit you in the throat whilst the bass growls around but soon a violin part or soothing vocal will sail over the top to calm things down. The whole is beautifully rendered. This is a fantastically satisfying collection of songs from a distant corner of the globe that deserves to be heard; these are quality musicians who have produced a quite brilliant listening experience. 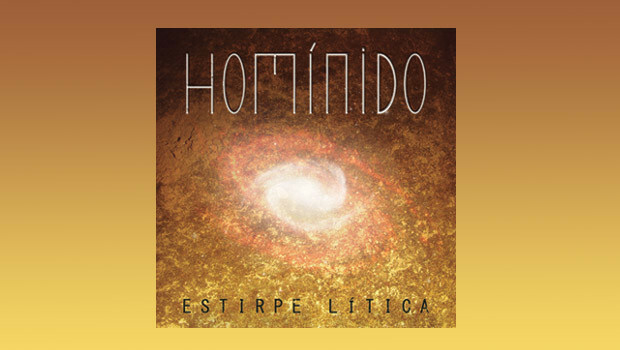 You can currently get copies of the CD directly from the band (bandahominido@gmail.com) or download it from their Bandcamp page where you can hear Estirpe Lítica in full.